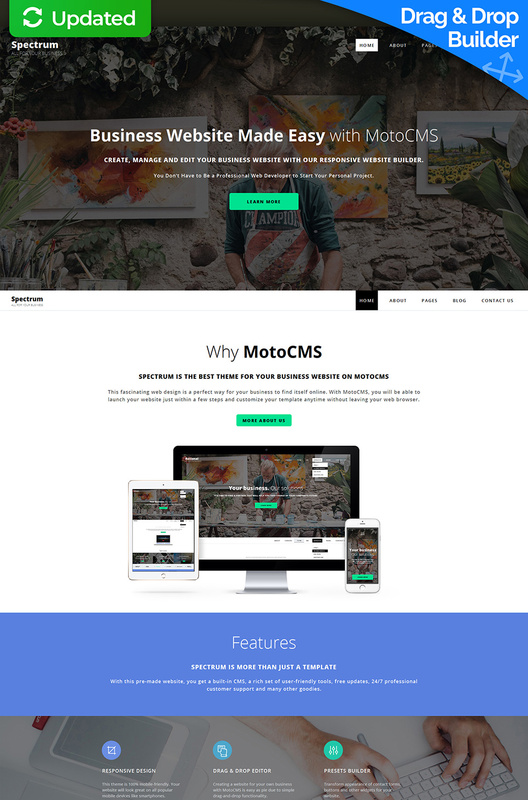 Regardless of what business you have, MotoCMS Spectrum will satisfy all the possible needs and even more. Whether you own a restaurant, a café or just think of launching your product, Spectrum is definitely a great template to consider as it has all the features to boost your company's success. This incredibly comprehensive and flexible business template combines both beautifully designed interface and impressive functionality. With such awesome features like drag-and-drop builder, 100+ pre-made design blocks, additional home pages, tons of google fonts and handy color picker, you'll be able to create a professional website with a personality strong as yours. And rest assured your company will be found by the right people at the right time as Spectrum is equipped with a powerful SEO integration tool — all you need to get your website in front of your target audience. And whenever you feel unsure of anything or have issues to discuss, contact our 24/7 Tech Support team for the lightning-fast help. KUP TERAZ - 526 zł. Sprzedano - 211 szt. tego szablonu.